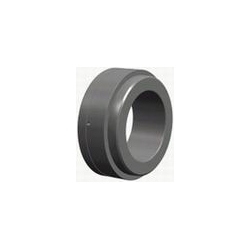 Spherical Plain Bearings are self-aligning spherical plain bushings that have inner and outer rings with spherical sliding surfaces, and can take a large radial load and a bi-directional axial load at the same time. There are many types of Spherical Plain Bearings, but they are basically divided into steel-on-steel types and maintenance-free types according to the kind of sliding surfaces. Steel-on-steel Spherical Plain Bearings have inner and outer rings of high carbon chromium bearing steel, of which sliding surfaces are phosphate-treated and then dry-coated with molybdenum disulfide (MoS2). They can, therefore, operate with low torque, and have excellent wear resistance and large load capacity. Spherical Plain Bearings are especially suitable for applications where there are alternate loads and shock loads. They have wide applications mainly in industrial and construction machinery. Maintenance-free Spherical Plain Bearings consist of an outer ring which has a special PTFE liner reinforced with copper alloy meshes on the sliding surface, and a spherical inner ring of which sliding surface has a hard chromium plating. Creep deformation due to compressive load is small, and wear resistance is superior. Thus, they are maintenance-free and can be used for extended periods of time without re-lubrication. They are especially suitable in cases where fixed directional loads are applied and are used mainly in food processing machines and construction machinery and in other applications in which the use of oil is undesirable or lubrication is not possible. Radial spherical plain bearing GE..EGE..ES GE..EGE..ES GE..DO GE..EGE..ES MB..
GEG..EGEG..ES GEH..ES GE..FO GE..GGE..GS MBH..